Summary: In this radiant homage to the resiliency, strength, and power of women, Wally Lamb—author of numerous New York Times bestselling novels including She’s Come Undone, I Know This Much is True, and We Are Water—weaves an evocative, deeply affecting tapestry of one Baby Boomer's life and the trio of unforgettable women who have changed it. I'm going to preface this review by stating that I adore Wally Lamb. I have read all of his novels and loved them, and I also had the opportunity to meet him at a Harper Collins BEA party one year. I was a little out of sorts, but I remember him being extremely friendly and gracious... and pretty good at holding a conversation with a crazy fan! So it goes without saying that I was extremely excited to get my hands on a copy of his latest novel I'LL TAKE YOU THERE. This book stars Felix Funicello (remember him from WISHIN' AND HOPIN'? ), and it is being released in tandem with an app version for the iPad and iPhone. I haven't seen the app -- I've only read about it on USA Today's website -- but the basic gist is that it will have "audio dramatization, soundtrack, film clips and 360-degree gallery." It sounds a little crazy but I imagine it will work for I'LL TAKE YOU THERE because the background of this story (which is also a little crazy) takes place in an old vaudeville theater. Felix, who is preparing for the Monday night movie club that he hosts, is greeted by the spirit of Lois Weber. For those of you who don't know Ms. Weber (like me! ), she was a female movie director from the silent film era who was way ahead of her time. Ms. Weber takes Felix on a film journey as scenes from his youth are presented on the theater's big screen. Other famous figures from the film industry show up to "talk with" Felix too! As Felix watches some of the important movies from his past, he is able to see various women who had an impact on his life. He reflects on his relationship with his sisters, especially Frances who had some pretty major issues during her teen years. In addition, he "meets" Verna, a young woman who wanted to be the 1951 Miss Rheingold but ended up dying far too young. These scenes are interwoven with present day conversations between Felix and his adult daughter Aliza, a writer for a New York magazine who is conflicted between her views on women and her role at the magazine. 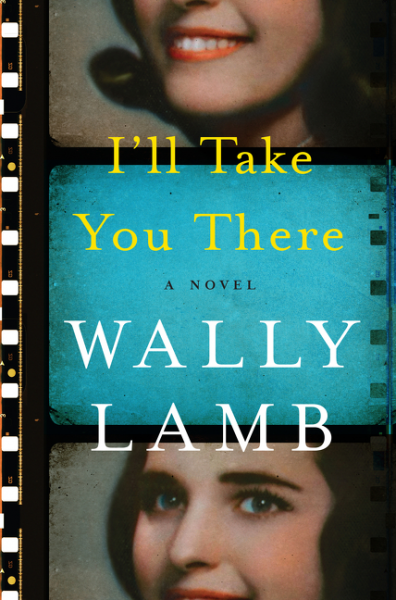 All in all, I enjoyed I'LL TAKE YOU THERE but it wasn't my favorite Wally Lamb novel. While I definitely appreciated that this novel explored the issues women have faced through the years, I didn't really understand why he used the ghosts and movies to convey these messages. I would have much preferred for Felix to just narrate these women's stories (although I'm not sure how he would have discovered the truth behind these women without the movies.) I guess what I'm saying is that I enjoyed the women's stories. I just didn't love the vehicle Mr. Lamb used to bring them to Felix's attention. Maybe it's because the ghost and movie aspect just felt a little fake to me. These scenes had some silly aspects to them which didn't exactly jive with some of the more serious themes of the story. Mr. Lamb has never been one that shied away from painful issues, and this book was no exception. I don't want to give too much away, but there were some really important topics discussed in this novel including adoption, anorexia, mental illness, and unwanted pregnancy. One interesting thing that was included in the novel was a magazine article written by Felix's daughter about the history of the Miss Rheingold contest. I guess I'm too young, but this marketing campaign was a pretty big deal back in the day. A Brooklyn based beer company had regular old people vote for a Miss Rheingold each year for over two decades. I found her article to be very interesting because of the history of the competition but also because it says a lot about how far women have come through the years. I also appreciated that Mr. Lamb used the Miss Rheingold story to link the present day with one of the past female characters. Overall, I found I'LL TAKE YOU THERE to be a beautiful tribute to women and feminism by one of my very favorite authors. While I didn't love every single aspect of this book, I still think it's worth the read. I'm also very curious to check out how the app works with the story. I received a copy of this novel at the 2016 SIBA trade show. I love Wally Lamb too! I didn't realize there's going to be an app for this book. I might wait until it comes out to read it.